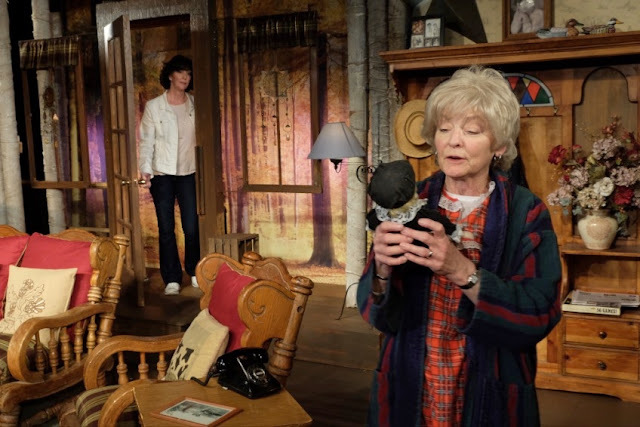 Carol's Theatre Reviews ~ It's Fun To Go Out: “On Golden Pond”: An Early Valentine for the Young At Heart. 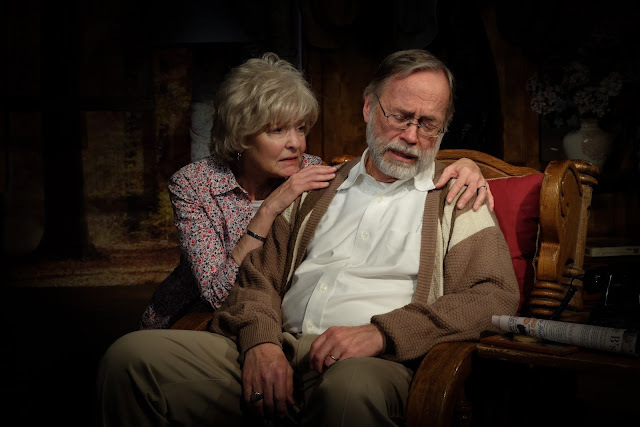 “On Golden Pond”: An Early Valentine for the Young At Heart. 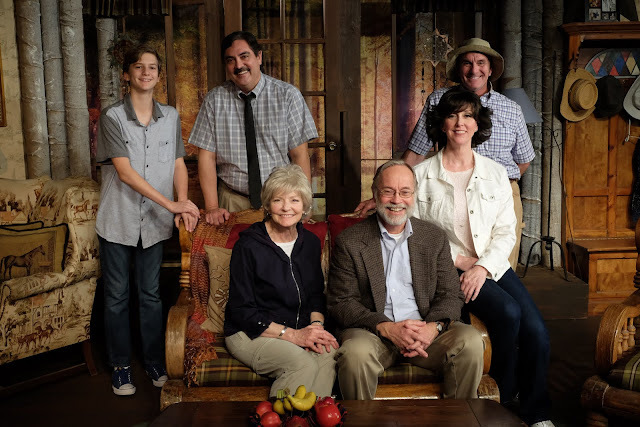 Whether we like it or not, it’s difficult not to be taken in by Ernest Thompson’s characters and their story in his play “On Golden Pond” now showing at the Welk Theatre in Escondido through Nov.5th. Some might call it Welk’s swan song as it will be the last show produced at this theatre while renovations are being done to the 40 something year old lobby. This paricular show is being produced by Randall Hickman and Doug Davis’ Broadway Vista organization. This is also the second time Hickman and Davis are dusting off this little gem. For yours truly it’s an early valentine for the young at heart and all the eternal romantics out there. The play ran on Broadway in 1979 for 126 performances and was later made into a movie in 1981 with Henry Fonda, Katherine Hepburn and Jane Fonda (Henry won an Oscar for his performance. Sadly he died shortly thereafter), you will have a chance to see it now, but because of its short run, get your tickets soon. “On Golden Pond” is the bitter- sweet love story between Norman (Lou Slocum) and Ethel Thayer ((Marilyn Wolfe). It’s a testament to their love, their devotion and their commitment to each other. Norman is a retired college English professor. They have returned to their cottage on Golden Pond in Maine, from Boston where they now live. 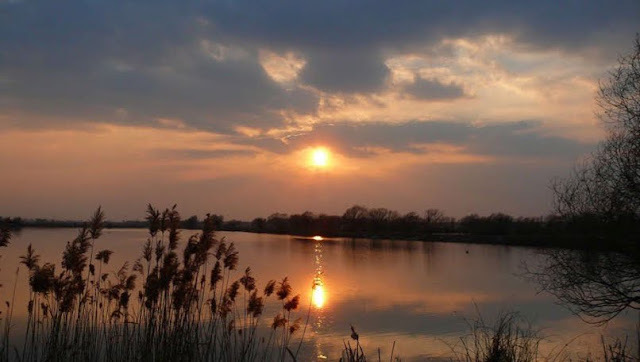 Every summer since their marriage forty- eight years ago, they spent the summers on Golden Pond. Norman fishes, reads and chats with the neighbors. Ethel picks blueberries and whatever else grows in the wooded area outside their cozy cottage. She bakes chocolate chip cookies and most of all she puts up with Norman and all his mishegas. The two sing to the loons (“Come here, Norman. Hurry up. The loons! They’re welcoming us back.”) that are there every summer and life is good. But as we all know there are a few wrinkles in every life and we are about to relive them with this ageing couple coming face to face with their own immortality. The play opens at the lake house and on this particular summer Norman will be celebrating his 80th birthday and he’s scared. He’s emotionally unavailable, stubborn to the core and rages with bravado. She tries to make up for it by both doting and disregarding. He loves fishing and the Boston Red Sox. This year though he’s rather pissed with the team. Coming from Boston, I get it. They can break your heart. The last time he got excited about anything was when John Kennedy was elected President. She loves to look out at the Pond and coos to the loons. He checks out the classified ads to see if he can keep himself busy. They muse over long ago photos. Memories abound. These past years however, she noticed that his memory was not as sharp as it had been in the past. It’s proven when, and in an emotionally disturbing scene he sets out to pick some berries. At her urging, just for him to be busy, he leaves with an empty pail. Shortly he returns with an empty pail because he forgot the trail and was frightened he would get lost. They enjoy each other’s company only as those who have shared a lifetime living that long together. She hovers, he’s crotchety and filled with bluster; she calls him an old poop and he ignores it. Back row: Reese Castin, Torre Younghans, Doug Davis. When they learn that daughter Chelsea (Holly MacDonald) will be paying them an ‘unexpected’ visit with her new boyfriend and his teenaged son, emotions run high and important changes happen over the course of this particular summer. They happen because the friendship/relationship between the two leads, Norman and Ethel is so genuine, respectful and loving that it simply transcends any awkwardness that might otherwise get in the way. They happen because life is about getting older and about being painful and because reconciliation and letting go is the natural order. They happen because love comes in waves, and often it hurts and children grow up and leave. They happen because there are no guarantees in life and Norman knows that, as crotchety and absent as he may seem. They also happen because director Randall Hickman and his all around talented cast weave pieces of fragmented lives together making humble and fragile everyday folks whole, enough so that you really care about what happens to this family in the future. When Chelsea, her boyfriend Billy (Torre Younghans) and his son young Billy (Reese Castin) arrive from California the Thayer household is turned upside down because young Billy is left to the care of Norman and Ethel so Chelsea and Billy, Sir, can vacation in Europe without the complaining of a 14 year old. After about a Nano second the youngster, who is taller than Norman, is taken under Norman’s wing and the two, no holds barred, form a friendship second to none or one that Norman has ever known. They fish every day. Young Billy is given assignments of books to read and Norman turns into a mensch with a purpose even though he will deny it. Slocum’s Norman is absolutely, without a doubt perfect as a man in his twilight years holding on to his dignity the only way he knows how, with a good offense. Both Slocum and Castin run away with the second act. Castin is just what the doctor ordered for Norman and he’s loving it, but don’t ask him to tell you. Younger folks have a way of putting a spring into the steps of their elders, and young Billy does just that for Norman. Doug Davis, the mailman has his Maine down-Easterner accent to the last broad ‘Ahs’ most of the time, and is quite funny as the boyhood boyfriend and historian of all the folks living on ‘the pond’. After all the years and Chelsea’s divorce, Charlie still has a crush on Chelsea and their friendly repartee lends insight to their growing up summers on the pond. Torre Younghans’s Billy Sr. holds his own under Norman’s questioning and like it or not, he’s not going away. In fact when the couple returns from Europe they announce that they were married there. Since Billy is a successful dentist in California, Norman wants to know if he can get a discount on his dental work. Yup. That’s a typical New England sense of humor. Thomas wrote “On Golden Pond” when he was 28. And most of his insights reflect the time and East Coast attitudes (He grew up in Maine) about religion and the Gentleman’s Agreement. I would be remiss if I didn’t mention overtones of anti Semitism and racial prejudice regarding what religions and colors were allowed to live on Norman’s sacred pond. Even that fact that Billy, Sr. was a dentist brought about a remark from Norman asking if he was Jewish. I guess I’ll have to let that one go now that there are bigger fish to fry, unfortunately dating back to those times we thought we had overcome, only more blatantly. Randall Hickman and Doug Davis built a cozy and attractive looking interior cottage with all the fixin’s. Jennifer Edwards does a fine job with the lighting and costumes provided by Broadway Theatre. Thank you for your sharing articles. They are very useful and interesting.The information is essential for me.I have a fondness for your post.